My little Olympian Wave-3 Catalytic heater is the smallest heater in the Wave series. Even so, it kept me comfortably warm. I did not have to keep my nose inside the sleeping bag when the outside temperature descended to 52℉ early this morning. When the Wave-3 is only warming my living quarters, it will be fine warming the smaller area. Also, Wave-3 will be aided by insulation! My wood construction method is Gorilla Wood Glue and brad nails. In assembling the first drawer that I Blogged to you about yesterday, I first put glue on the parts about to be joined. Then brad nailed the joint to keep it together while the Gorilla Wood Glue set. 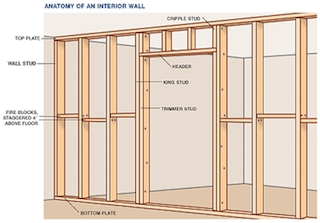 This construction method will be the same for framing the floor and walls of my living quarters. Although the image below is using 2 x 4 lumber and I will be using 3/4 x 2, the construction basics are the same. 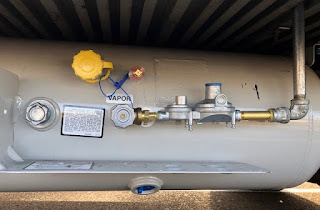 Reader Phil in Phoenix reminded me that I had not yet published pics of the completed propane installation! This is the propane line coming from the tank. the propane for my living quarters. Your ‘ 3/4” x 2”’ will most likely measure out as 5/8” x 1 5/8”. Really, really flimsy. You have lots of space and weight carrying ability. Why not go with a 2” x 4” which is really a 1 5/8” x 3 5/8”? Thank you so very much for taking your time to help me! When you say you were warm last night, how critical is the insulation? Could a person do without? Insulation becomes more a factor when the temperature drops below 50℉. It's been my experience that when the temperature drops below 60℉, heat is a very happy thing to have! I wonder at what outside temperature that 130 SqFt was calculated? "square feet".... Aren't cubic feet more appropriate when measuring air heated? I hope by the time you read this you will have a shutoff valve installed in the inside propane pipe. Do not procrastinate about this. Why is an inside shutoff so critical? RVs don’t have this. An inside propane shutoff valve is not critical. However, it is a good idea. And, it costs so little. I ordered the inside propane shutoff valve yesterday. 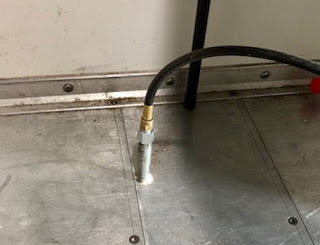 Matt, in a rv the propane lines are not exposed. In Georges case it is and construction work can cause accidents.